The constant change and the barrage of updated releases came to a shuddering halt during May. Once the Easter holiday's were over and done with then the X-Plane world went into a semi-shutdown that left you exhausted from the overwhelming changes that has been so huge since November 2016 and the release of (even in beta form) X-Plane11. For me it was more than welcome as I had for two weeks during the month a soul sapping head cold (Thank you a late Northern Winter), and the strange head feeling and hacking cough didn't help my mood, but thankfully X-Plane wasn't for once to blame. Certainly with such major changes and the sheer thrill of the ride of the X-Plane11 release with the huge amount of updates that was required to switch a lot of the earlier versions to be able to operate in their new surroundings was simply overwhelming, I loved it don't get me wrong, but it was very draining as well. That is not to say that the ride is completely over yet either, there is certainly more updates and releases to come but not in the context of the changeover period. We all want and relish these periods, but sometimes a bit of a slower more sedate period is good as well. The problem with this huge constant change is just that in it does create a certain style of instability and even in areas of chaos in that in one period that nothing was interacting well will another piece of the system to give you a clean running simulator. That is part of the deal of course but at a point where you were running a beta, with a beta and a beta aircraft then your computer is going to throw the wobblies and you are going to get enough CTDs (Crash To Desktops) to make you want to throw the towel in and just go to a nice quiet place to jabba to yourself in a monastery high in Nepal somewhere. Let me put it this way I cursed a lot. So the May slow down was a sheer relief, but more than that as it gave you time for consolidation. The biggest mistake people make in life is that they just want more, and then even more or if you are onto a great thing then stick to it. The problem in life is that you can't just keep having more and more as something somewhere has to give (mostly the money first) but your health can't take it either. In others words "having everything all the time is bad for you" I mean even The Beatles and One Direction had to give it away eventually and poor Elvis fell off his toilet. So the word "consolidation" is an important one. I do X-Plane computer housekeeping about twice a month, but the biggest problem with X-Plane now is just its sheer size. Many Flight Simulator users will of course fall off their chairs laughing at that X-Planers are complaining that their simulator is overloaded, but it can get now seriously very unwieldy very quickly. X-Plane itself has doubled in size in just a few years from around 36.000 items to around the current 82,500 items and that is in less than just TWO YEARS. In reality X-Plane11 has doubled in the size of the simulator. Add in the size of the HD Global scenery, then the monster of your "Custom Scenery" folder and the sheer amount of aircraft now available for the X-Plane platform. There is a lot of choice now, a huge amount of great aircraft and if you have a period of huge simulator version changes like lately then you will have to cull some of them and even lose some real old favorites in the march of forward progress. So just updating and realigning aircraft and scenery can be and is a huge task, it can take days and lately even weeks and you hope your download bandwidth can handle it all. But the final result is hopefully a better more leaner running simulator than the gargantuan monster you had been wrestling with for years. With the X-Plane11 release these tasks are multiplied with some aircraft developers releasing updates almost fortnightly. If one thing I have learned with X-Plane11 is that to have a better simulator is to keep lean and mean, less is more and that statement is important as it is very easy to fall back into nasty old habits and start overloading the simulator with things you will never use or actually need. Seriously will you ever land at CYUB - Tuktoyaktuk if you are not either flying a Canadian wilderness adventure or are a local bush flyer, certainly no, but every time you start up X-Plane or fly over the northern pole then X-Plane will load that scenery for your convenience. Then multiply that by the size of your custom scenery folder and you can see the size of the problem. Most certainly if you love bush flying then collect all the great remote Alaskan strips and have your fun, but if your main routes are mostly A320/B737 services around Europe or North America then it is a bit of a waste of a resource. My main aim with X-Plane11 is to produce a pattern of the best of the great scenery that I will use constantly and consistently to get the best return from the simulator, then everything else is just waste. Don't get me wrong in that nobody more than me loves to visit an old friend of a scenery or explore a new one. But it is highly important to keep your networks clean and free of the dreaded pop-up dialog box that notes that "error loading the scenery package" pain that you can't leave your computer screen even for a minute or two without it popping up. Europe seems the worst of this for some reason. Then we get to "plugins". If any area of X-Plane that can give you the most pain it is an overflowing plugin folder. I have always been vigilant with my plugins from the start, but will usually try something new now and again to see if it add another dimension to the simulation experience. Personally I have kept away from lua scripts although I don't doubt their great ideas and features they can bring you. Ditto is scenery enhancement packages as with anything that adjusts or changes the basic internal root X-Plane based items. My reasons are purely that I can't stray too far from the basic X-Plane package so the reviews are realistic and the feedback correct on the what the simulator is reacting to that particular aircraft or scenery. It also became too hard to keep on replacing the internal changed items every time there was an X-Plane version update that replaces these internal items automatically. But overall I found that they didn't really make that much of a difference as Laminar's original concepts were usually right or better in the first place. But some "Plugins" I will defend and have become standard installs. Simcoder's Headshake is great at giving the simulator some movement at crucial times you require it, like takeoff or landing. DiscreteFPS is a gem in showing you your current framerate in the top left of your screen. Marginal's Autogate is of course a basic requirement as is his Sea Traffic. JARDesign's exceptional Ground Handling Deluxe and Tug Master Deluxe are great for giving you a lot of action around the gate, although I will admit that Tug Master is in badly need of an update, it has become very slow and doesn't turn very tight. The two big plugin concepts that I love are WorldTraffic and xEnviro. It is a personal choice on if to use the much upgraded built in X-Plane A.I. system of providing airport traffic and I know that many users love X-Life. But both are very reliant on the X-Plane A.I. system that gives both restrictions in that only twenty aircraft can be assigned (with the corresponding framerate hit) to X-Plane. Many users will note that lite aircraft are available for A.I. in usually 1.5mb sizes so this is not an issue, but you are still restricted. WorldTraffic doesn't have these restrictions, but it also very complex and extremely complicated to set up, but when it works it is sensational. I can get around WorldTraffic's current restrictions because my main airport network is not too large and I can refine each port correctly to work with WT, so in this scenario it works very well, a new totally updated WorldTraffic3 is currently in the works but Greg Hofer's computer has done a meltdown (or cratered) and hence a delay. But early testing rumors note WT3 is sensational and it will be a free update to current users. xEnviro is another huge step forward for X-Plane. Sadly Mac or Linux users still can't currently get access to xEnviro, and I feel your pain, but will note the wait will be worth it. The funny thing for me is that as noted above I don't use plugins like this with X-Plane because I need the sim to be a basic layout for reviews, hence the far few plugins I do use, also as noted I don't like to change the basic rules of X-Plane either, but with xEnviro I break both of my own laws in one go. I won't bother to bore you again in another month with another "wow" or "amazing" but even six months after its release it still totally blows me away with what it creates visually and it totally changes the feel and in the way you use the X-Plane simulator. If I have to turn xEnviro off for some reason I think life is totally boring until I can switch it right back on again (okay I know I am boring you again) but it should be stock standard tool for X-Plane by every user. In saying that the developers haven't exactly redeemed themselves to their customers. There has been no updates since late December 2016 and plugins like this should put current performance before new features. A single performance update and a plugin for the Mac (I don't know if Linux will be able to run xEnviro) and that should have been top of the work list more than any nice new 3d clouds or Rayleigh scattering, but I will note that the long X-Plane11 beta run and Xenviro's own local disconnected internet connection caused a few issues, but this plugin is an important release for both X-Plane and the developers in question, if the plugin wasn't so good or really buggy then that approach could have had bigger ramifications. But to date we are still waiting. Which brings us to to that X-Plane11beta run. Yes X-Plane11 has gone global, and yes we are still getting betas as well. "Enough you may cry", but the end of the road is finally in sight (oh thank god for all that). Laminar is finally doing Performance Optimizations for X-Plane11 and the results are in. X-Plane's 11.02 release is sensational, and so now is X-Plane11. Finally the "light at the end of the dark tunnel". All the pain of the above last few months is finally clearing to what we really have now in the X-Plane simulator in X-Plane11 form. So the results of months of beta pain are in and the point of this article. Running X-Plane11.02 with the updated JARDesign 3.1r2 (with the new excellent BSS v4 soundpack) and Xenviro v1.06 and with WorldTraffic 2.1.3. it was time to see something for all the changes. Flight was from MAN (Manchester) to OSL (Oslo) and it was a wonder to behold. no crashes (CTD) framerate touching even 100fr over the North Sea, beautiful fluffy clouds and great scenery at both ends. To top out the feel the flying was perfect, pure routine, hit every number in speed and altitude perfectly, could simulation get any better? For the moment no, but X-Plane will still move forward. So was all the pain worth it, yes definitely, and to top it all off I just reloaded the aircraft with more fuel and passengers and went straight back to Manchester... bliss. A few notes in that in May helicopters came to X-Plane11 with both the Bell 407 from Dreamfoil and the S-92 from DMO and it was great to fly both again in the new simulator version. Sceneries have also been highlighted this year as X-Plane now feels it is starting to fill in. Oslo by Aerosoft I really liked as with JustSim's ELLX - Luxembourg that I covered in April. Another note is that the FlightSimCon is coming around again soon on June 10-11 at the Sheraton Hotel at Bradley Airport, Windsor Locks, CT, USA. 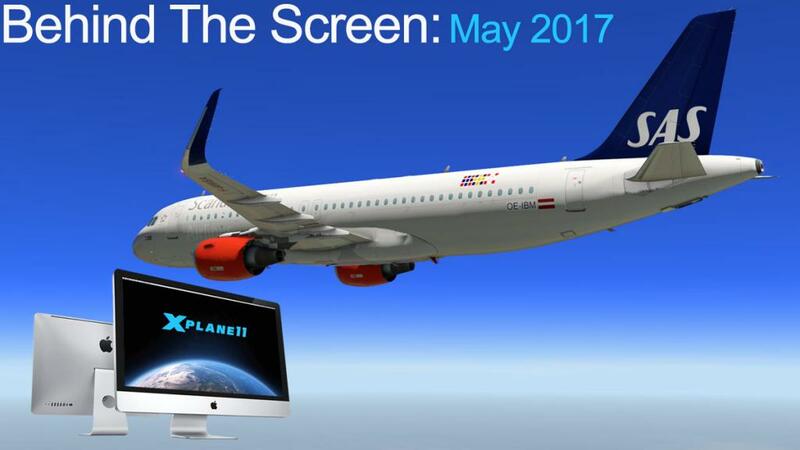 Last year X-Plane's Laminar Research released the details for X-Plane11, so this year they will be going back with the fully tested and refined version. I think personally there will be a few surprises for the users that have ignored X-Plane in the past and a few developers will note that they maybe also wondering if they are also missing out on the future and where the real money is going to be made in what they once they sniggered as a so called "hobbyist sim". I hope Laminar run a lot of large screens showing off their latest baby, and usually they always pull something new out of the magicians hat for us... it will be an interesting few days.